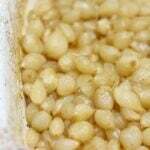 Pearl onions, caramelized with a glaze made of sherry and honey…these are delicious! Takes about 10 minutes to put together and an hour to bake. 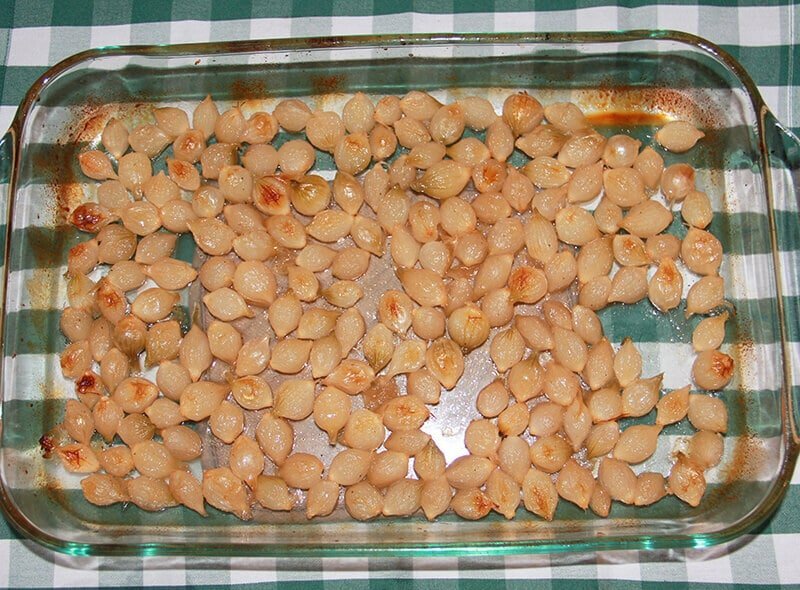 My friend Ashley made these roasted pearl onions years ago at a dinner party and shared the recipe with me. Everyone at the dinner party ate these onions until we were scraping the bits off the bottom of the bowl—they were that tasty. Slightly caramelized, with tangy sherry and sweet honey melding together to form a delectable glaze…they are the perfect side dish to just about anything. Our family loves these pearl onions as an addition to our Thanksgiving menu and they are probably the easiest thing on my list to make. The sauce comes together in about 10 minutes, there is no chopping, and then you just bake until golden brown. I tried using fresh pearl onions the first time I made these. 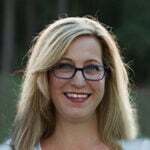 Blanch and peel…let me tell you, I’d rather have a root canal. Now I buy the frozen bags of already peeled pearl onions and have had nary a complaint from any guest. 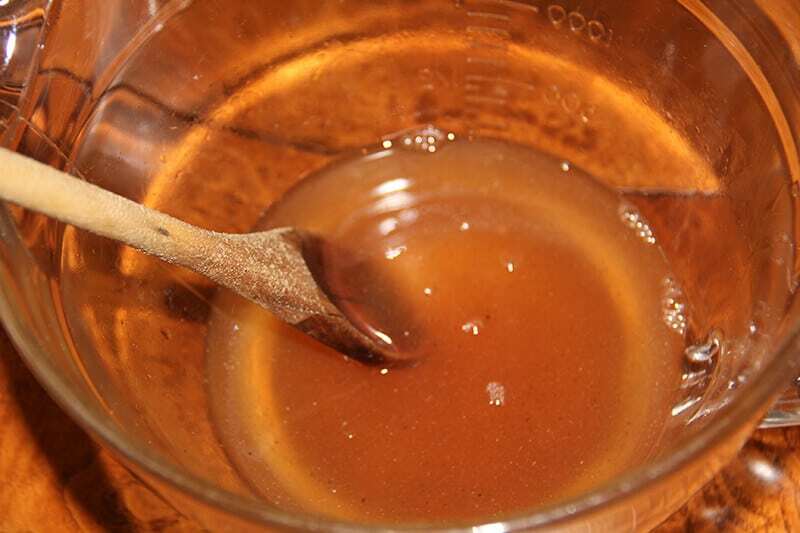 Mix about a cup of dry sherry with 1/4 cup of honey and splash in a tablespoon of apple cider vinegar. Add 1/4 teaspoon salt and 1/4 teaspoon freshly ground black pepper. These are too crowded and won’t caramelize properly, so I transferred them to a larger baking dish. I let the onions thaw well so if there’s any excess water I can drain it before I cook them. Spray the dish first and then pour in 2 lbs. 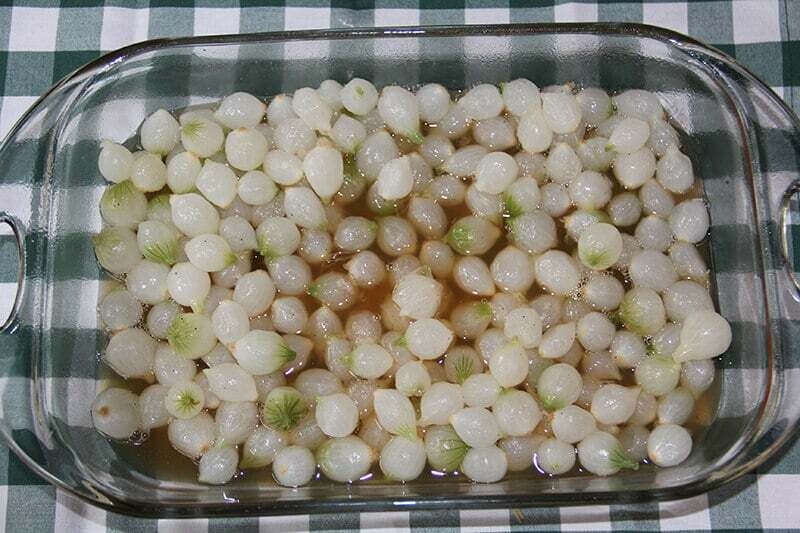 of thawed pearl onions and pour the sherry mixture over the onions, stirring gently to mix well. Bake at 400° for about 1 hour and 15 minutes, until the onions are golden brown. Stir occasionally and if they start sticking to the bottom or dry out just add a splash or two of red wine. Roasted Pearl Onions are perfect with almost any grilled or roasted meat or for when you want to have a vegetarian feast. And you can make them all year long. 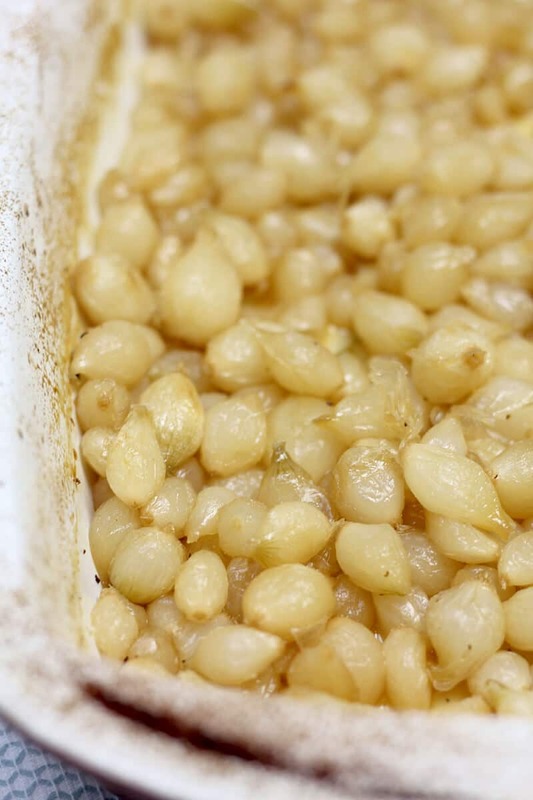 Here’s a quick, how-to video for my Roasted Pearl Onions. Caramelized onions coated with sherry and honey, a delicious side dish for fish or meat. Preheat oven to 400. Combine sherry, honey, vinegar, salt and pepper and whisk until blended. Spray large baking dish with cooking spray and pour in the onions. Pour the sauce over the onions and stir gently to mix. Bake for 1 hour and 15 minutes or until golden brown, stirring occasionally. If onions start to dry out add a splash or two of red wine. I absolutely have to make these!